so it might be a good idea, to honor those lost that day, for the country to come together now. Just a thought. The Flight 93 crash site one year later. It was clear, cool and sunny with a wind that snapped the flag flying overhead. There was a chain link fence pinned with notes and offerings of condolence while a handful of people, regular civilians and some family members of the crash victims, stood staring in silence at the crater in the distance…still numbed by it all. 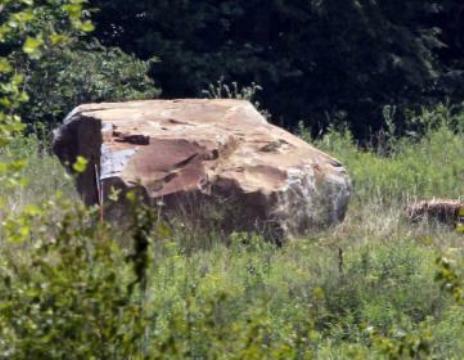 A 17 ton boulder now sits at the site of that crater marking the spot where Flight 93 came down. As I look back at that visit I clearly remember that even with the cars parked along the roadside, the people gathered at the fence and the wind whipping across the field that is was so very, very quiet. Other-worldy quiet. Appropriately quiet. Take a moment today and remember those who were lost that day in Pennsylvania, NYC and DC.